Believe it or not, every Rolex is not necessarily worn. Although Rolexes are designed to withstand the rigors that come with adventure, exploration, or the theater, not everyone wears their Rolex because they wear a watch that if it does get scratched, it is not a big loss. Just like how people have beater cars, beater clothes, and beater shoes, some people have beater watches. That said, when one is not carrying their Rolex, how does one travel with it. There are numerous watch cases available that range from the mid-three digits down to using an old sock. When trying to decide how to carry a Rolex, be sure to have something that covers the caseback, the bezel, and the crystal. When a Rolex is not worn, the caseback is susceptible to scratches from the bracelet clasp. The bezel and the crystal are obviously areas that would be covered. Some people have been known to use old socks, but the drawback with those is that they may get easily confused with something that can be dropped, lost, or thrown. Others have used eyeglass cases, but there too, can easily be mistaken for something that is not carrying an item that costs well into four-digits. 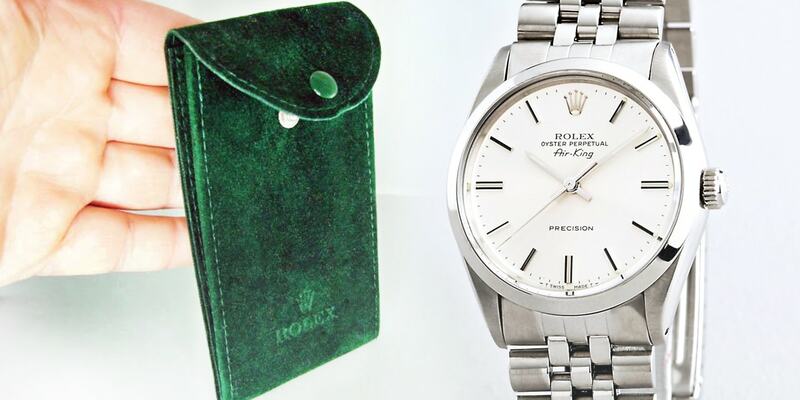 Perhaps one of the best cases to use for carrying a Rolex is one that is made by Rolex themselves. Rolex distributes service pouches, much like the one shown here for carrying their watches. These pouches were initially developed for Rolex service –when a customer would pick up their newly serviced watch from Rolex, they would receive their watch and this carry pouch. Unlike a sock or eyeglass pouch, this case clearly says that there is a watch inside. 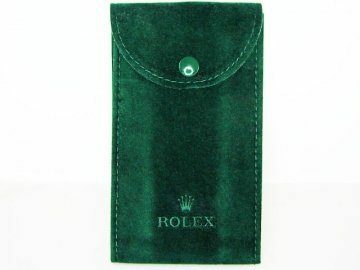 The pouch contains an insert to slip between the bracelet clasp and the caseback to prevent scratches, and there is soft velvet suede that protects the crystal. Although it is not a hard case, it is a great pouch to carry your watch in your pocket or briefcase. As stated elsewhere on the blog the safest place for a Rolex is on one’s wrist, but if not there, a Rolex pouch is the next best place.